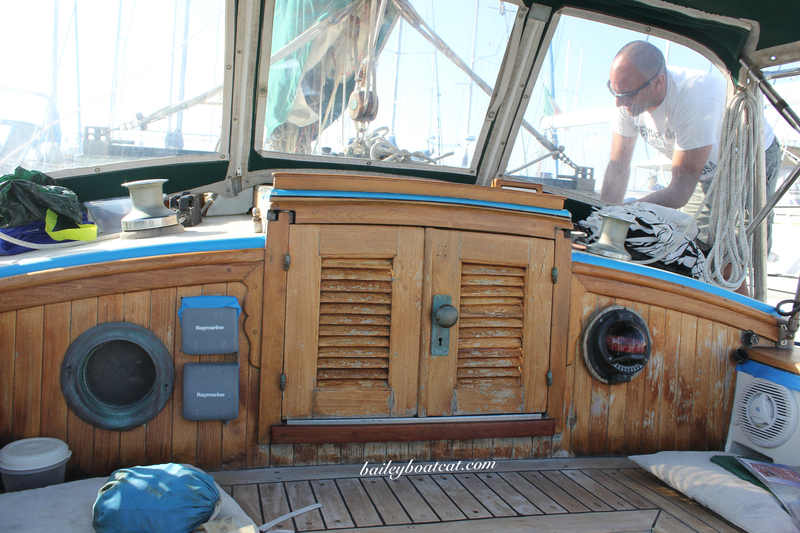 Varnishing the boat is a huge job and is a work in progress at the moment. 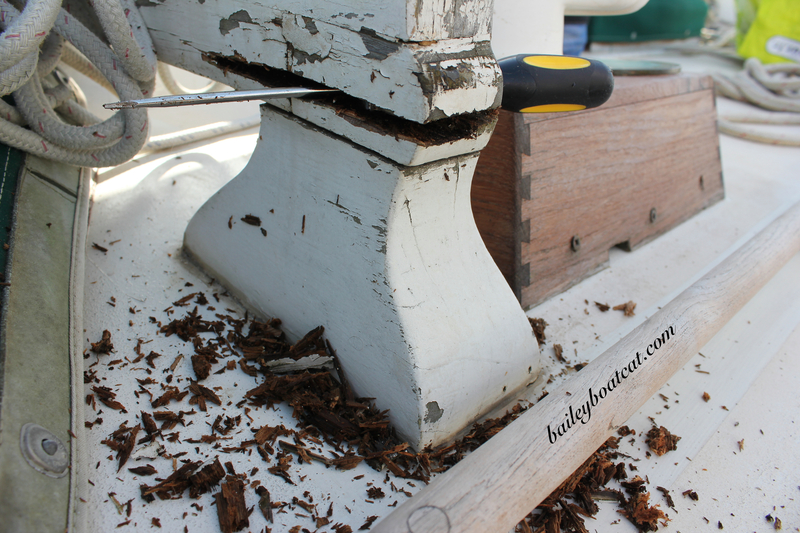 As you can see in the sneak preview below, the trim has been done and now it really shows up how in need the rest of the wood is for a bit of TLC. As often happens on the boat before one project has finished, we’ve got another one on our paws. We’ve also discovered that we have a rotten traveler aboard. 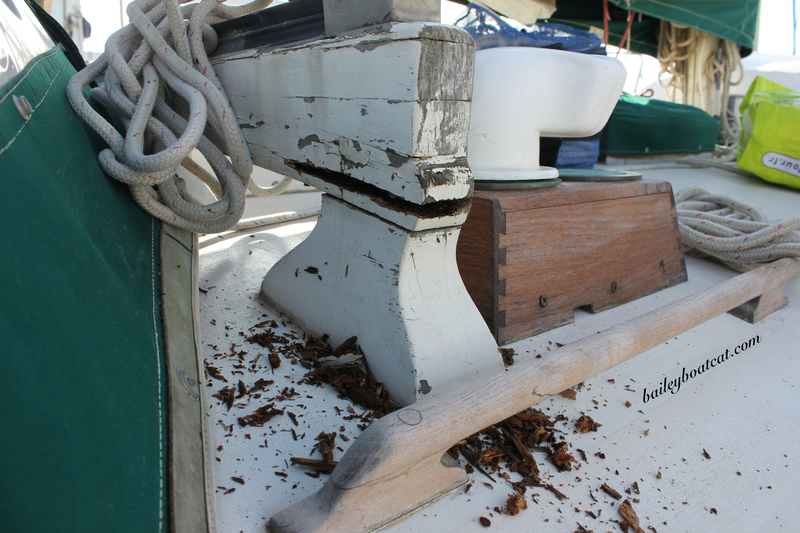 No not a nasty explorer…rotten wood! The traveler allows the sheeting assembly (that connects to the boom) to ‘travel’ back and forth along a lateral track (on Nocturne across the deck) to help give the sails shape. We’re going to be busy for months to come. 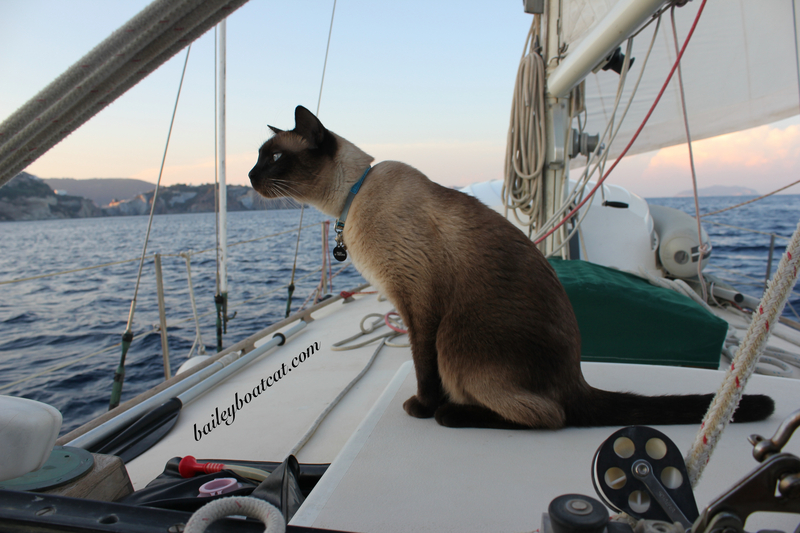 It will all be worth it when we set sail for Greece this summer though! Yes exactly! Boat = Break Out Another Thousand! We’re lucky that our captain is great at doing jobs himself. As the Admiral I still have to supervise of course! Bisous fursibs! I’m on the job Monty! Greece will be worth it! At least you found the bad wood while in port. Better to replace/repair now rather than have it break while at sea. Exactly what we thought David! Tehehe! I hadn’t though about that! Better to get it sorted before we set sail I suppose! I’m happy to supervise to ensure safety! That looks like a LOT of work! I bet your humans are glad you are there to supervise, Bailey! Lots of hours and elbow grease (well for the humans) It will all be worth it though! *PICKERELL* that sure ISS sum rotten wood there Bailey!!! Mee finkss yur Pappaw will fix fingss good tho rite?? ?